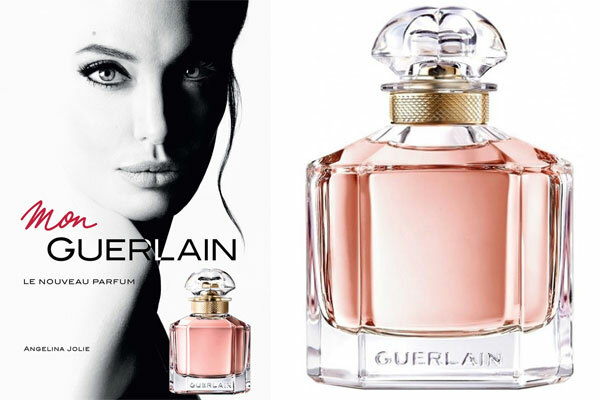 Mon Guerlain by Guerlain - A floral oriental fragrance for women. Created by perfumers Thierry Wasser and Delphine Jelk, this scent includes notes of vanilla, lavender, jasmine, and sandalwood. Mon Guerlain perfume is housed in an updated version of the 1908 Baccarat quadrilobe bottle featuring a pink juice. The feminine perfume was launched in February 2017 and is available in an eau de parfum spray, matching body products, and a scented candle. The fragrance campaign features actress Angelina Jolie. Package Design A modern version of the Guerlain 1908 Baccarat quadrilobe bottle. Your fragrance Mon Guerlain in its "quadrilobe" bottle : created in 1908, the bottle established itself as one of Guerlain's iconic bottles. Simple and graphic, it echoes an alchemist's bottle and owes its name to its stopper, which is crafted from one piece to obtain a shape resembling four lobes. A century later, beautifully enhanced by a luxurious glass weight and a golden adornment, this bottle offers a contrast between strong taut lines and sensual curves, expressing contemporary femininity. Bold & Opulent - Perfumes with an edible, consumable quality often become favorites for life. This category is beloved by women who aren't into minimalism on any level; instead they prefer sexiness and drama, and they're drawn to fragrance ingredients that are a little (or a lot) less traditional.